April 4th marks three whole years of me being vegan! Now that’s not without a cheat meal or cheat snack here or there. Or the time I cried in the bathroom at a restaurant when they gave me a BEEF burger when I asked for a BEYOND burger (I get it… easy mixup). But for the most part, I’ve operated at at least 95% vegan for the past three years, and I think that’s saying something! I haven’t stuck with anything for that long, and I have never once regretted my decision to go vegan. So to celebrate that, and my upcoming trip to Croatia, here are my 5 best tips on how to travel while living a vegan lifestyle! Unlike when I first transitioned into veganism, now I travel- a lot. And I have a few rules for traveling, some of which are pretty unpopular, but here we go! My biggest travel rule is that I don’t eat vegan while traveling internationally. I know. You can begin hurling the “fake vegan” hate all you want. But let me explain! I think the greatest part of being able to travel the world is that we get to experience other cultures. Maybe we only get to visit these countries with these rich histories once in our lifetimes. I don’t want to waste that one time. I want to relish in the culture- which is so hugely impacted by food. That doesn’t mean I view international travel as an excuse to eat whatever I want. But if the traditional dish in a country has dairy in it, I’m still going to try it. I mean… if the traditional dish is steak, I’m going to pass. I still get sick when I eat animal products, so I can’t go crazy. But sampling various cuisines is such an important part of traveling. And while finding all of the best vegan restaurants in different cities has become something I’ve gotten increasingly good at, I think we should still submerse ourselves entirely into other cultures (but thats just me). Know before you go! Do the research beforehand! I always google “best vegan restaurants” in the city I’m visiting. This is so obvious, but people will forget before they get to their destination, and then cave because it’s too difficult to navigate a different environment. Keep a list on your phone of top restaurants as you’re researching so that you can refer back to it. This makes me really excited to find new places to try, so try to make it fun! Stock up early. When you get to where you’re going, hit the grocery store first. You might be tempted to rush to the beach or hit that first trailhead, but stop. Go to the grocery. Grab a few things that you can munch on if there’s nothing else around. Don’t wait until it’s 2am and you’re in the Uber on the way home from the bars and your travel buddies want to stop and grab pizza and you haven’t eaten all day because there were no vegan options. I usually grab a bag of arugula, baby carrots, a tub of hummus, and bananas. This gives me a lot of variety, for not much money (Helllllllo cheap!). Be prepared. In the weeks leading up to my travels, I get very in tune with my eating habits so that I can know my body before I take it to a different city or country. I always pack something for me to eat on the plane and for at least the first 24 hours of travel. One time I went to Stockholm and didn’t eat anything except Larabars for 2 full days because I couldn’t read the language. Whoops!! Could’ve been prevented had I just come prepared. Remember your staples. What food items can you always rely on? For me, when I’m out at restaurants, it’s usually salads, steamed vegetables, rice, and almost always french fries. If you know off the top of your head the ~usually vegan~ foods, it’ll be easier to decipher a menu and feel more confident in your food choices when you’re out and about. Take it one step further by asking yourself: What have you been craving lately? Can you pack some of those things along with you, in case you can’t access vegan options? Speak up! Don’t be afraid to ask your server if certain foods are vegan. I usually find the most likely vegan foods, and then I’ll ask “does this have any dairy or eggs in it?” or “Is this cooked in butter?” Knowing what to ask and not being afraid to speak up can really help you stay fueled up while traveling! And that’s it! Mostly, what all of this leads to is: think ahead! It is totally possible to stay vegan while you travel, and it can even be easy if you just prepare. What are your favorite vegan snacks for travel? Let me know in the comments section below! If you’re interested in following along with my Croatian travels, check out my Instagram to stay up to date! Breaking the Bank: Why Are Weddings SO Expensive? I’m about to dish out some pretty difficult news. Weddings are expensive as heck. Now they don’t have to be! You can really throw together a backyard shindig, full of love and draped with happiness, and I promise that it will be just as magical as if you’d spent $100,000. The Knot has the average cost of a wedding in America at right around $35,000, but that sounds like a pretty low estimate to me. In New York, you can expect to drop around $80,000, and often times more. And a big chunk of that is often times wedding photography. So I’m here to give you insider information and tell you why. 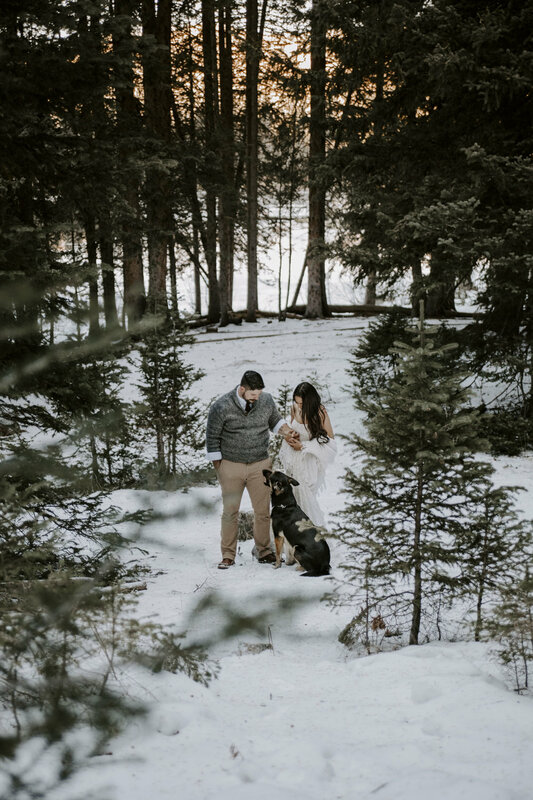 Accompanied by some images from a winter elopement I shot in small-town, backwoods Ohio! Before I dig into the why- I want to write a brief disclaimer. First- I’m not complaining about weddings. If you’ve been following along for a while, you may know: I only do what I’m absolutely thrilled by. The day I start to dislike any aspect of wedding photography, I’ll stop. 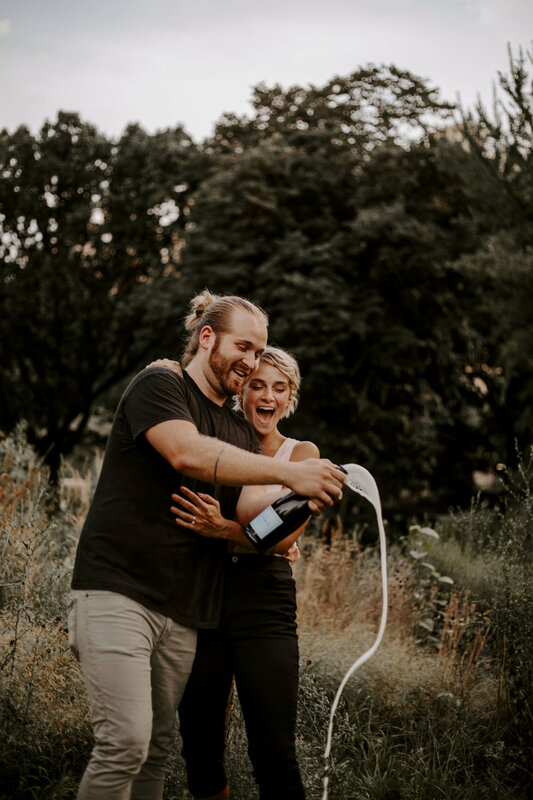 Instead, in this blog post, I’m just laying out some of the behind-the-scenes things that go on that might contribute to wedding vendors’ prices. And secondly- I’m not telling you to go drop money you don’t have on a wedding. I’m not saying that more expensive weddings are more beautiful or more memorable or more important. That’s not what weddings are about, and that wouldn’t be a true statement anyway. What I will say is that you should do what you want to be surrounded by those who mean the world to you (which is sometimes just 2-5 people! ), in a place that feels like home, with the one who matters the most. You can accomplish this in a courthouse or in the most extravagant ballroom. At my wedding, we ate shrimp & grits above a bar where I got drunk on $2 tequila sunrises in college… and it was the most perfect setting because it was exactly what I wanted, surrounded by exactly who I wanted. So all that being said- this is a fairly straightforward post. Weddings are expensive because…. well… they take a lot of work! And if you value other people and their time, this is not a difficult concept to grasp. Wedding days might last only 8-12 hours, but the preparation and post-production are so much more than that! I shouldn’t need to elaborate anymore because you should just trust me that my time is valuable, but just to drive it home, I’ll walk you through the wedding process, from the photographer’s point of view. I think there’s a common trope that if you tack on the word “wedding,” people just jack up their prices, but that’s simply not true. In fact, I start working months and sometimes years before the wedding day, so the idea that it’s just one day of work is a little bogus. Here’s how it goes: you, the couple, see my work online and reach out. Communications start, which I know may seem like not a big deal, but now amplify that by 10, 20, maybe even 50 inquiries at any given time (lol I don’t have 50 inquiries but some people do hehehe). I’m constantly emailing or texting with at least one couple. 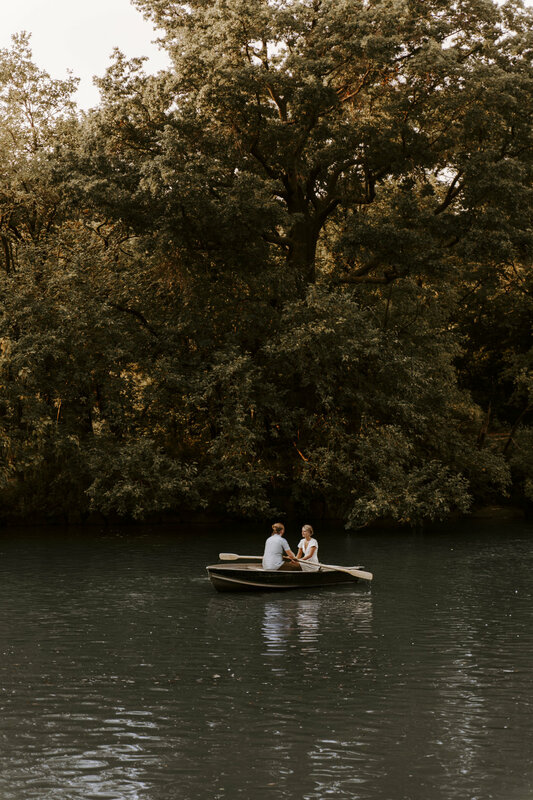 It takes a lot of time and back and forth to go through everything with each couple, and it costs a lot of money to afford services that help manage and streamline everything for you. In most cases, it takes both time + money. 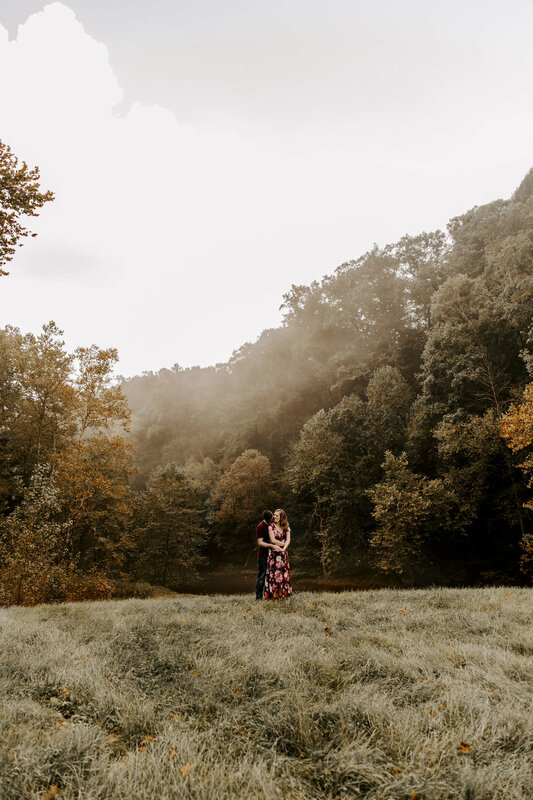 I’ve got my pipeline incredibly streamlined, but I still care so deeply about every single one of my couples and want their experience to be a personal one, which means I’m a part of each decision they make. This is time-intensive, and it’s only the communication leading up to the big day. Now let’s fast-forward to the wedding day (don’t you wish you could just skip all this planning and get married already!?) (hi, may I suggest a fun elopement? More on that in a later blog post!). By now, I’ve put in several full weeks of work to make sure that we’re already good friends before the wedding festivities even begin. You don’t want some random stranger or somebody who doesn’t know your specific timeline, favorite people, and unique details to be photographing your wedding, so all of this preparation is really, really important! And all of it takes time, and time is money. Let’s tack on eight hours of work for that wedding day. Then let’s tack on an extra 20 hours of editing time for all those photos. And don’t forget about overhead or cost of doing business! I didn’t really go into everything, but it’s so much more than just an expensive camera or lens. I just spent $300 on memory cards and lens caps alone. I use industry standard software and equipment that costs money to maintain, even though we sometimes think of it as a “one time $1000 camera purchase,” which is well below the actual cost of a camera anyway! At the very bare minimum, your wedding photographer deserves to cover the cost of shooting your wedding, and if we believe in ethics at all, then we also have to believe that their time is worth it, too. At the end of the day, I just want to make a living doing what I love just like everybody else. You can pay for an $80k wedding and hire a $500 photographer, and your wedding will look like a $500 wedding. Or you can have a $5000 wedding, hire a $4000 photographer, and your wedding will look like an $80k wedding. It’s all about what you find value in on your wedding day! I won’t pretend like I’m some freelancing wizard who knows all the tricks and trades and is making millions each year off of my photography business. I’m not. But! 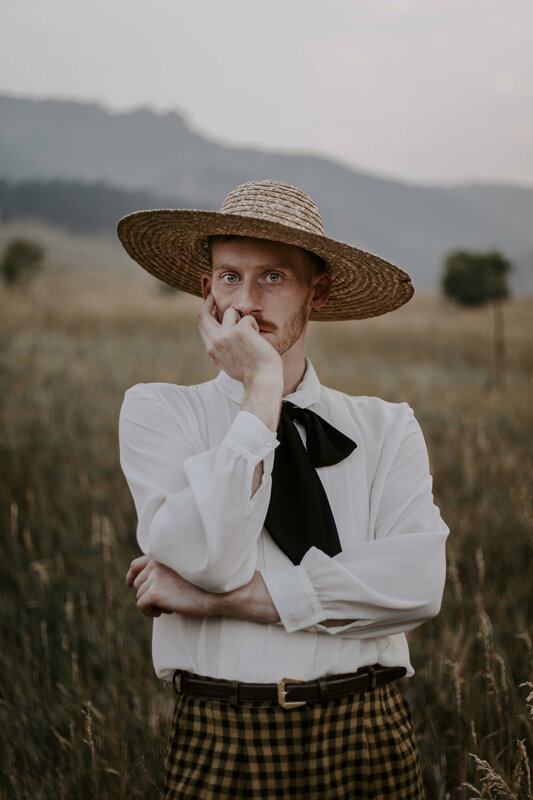 I am incredibly happy in my freelancing business and I feel like I’ve found a sort of golden ticket to the whole thing. And I’m going to tell you! Because I’m full of myself and want everybody to share my ideals! Kidding…. it’s because I really think this made my freelancing life so much easier and more enjoyable. 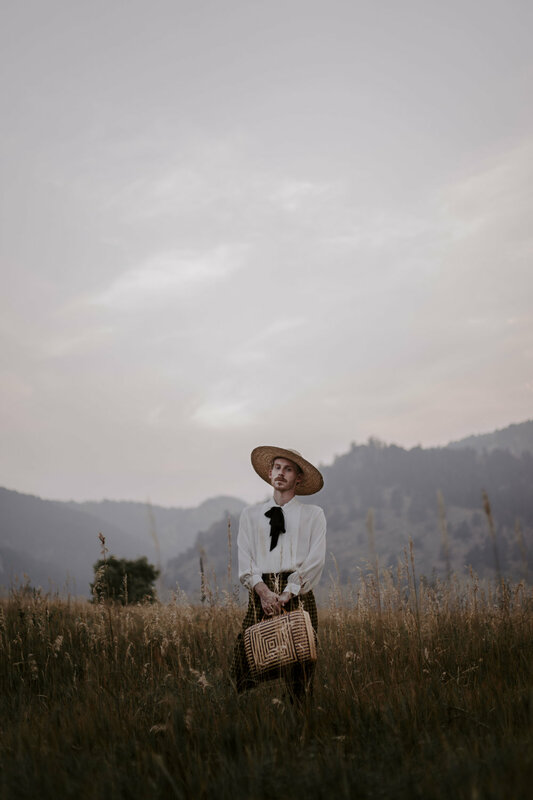 Which is why I’m pairing this post with the full set of images from my absolute favorite shoot this year- an elopement I was fortunate enough to shoot in the beautiful snowy mountains outside of Salt Lake City. It’s all going to tie in together beautifully, I promise you that! It’s not a scam, I promise! It’s a real tip that when applied, can make YOU the world’s happiest freelancer, too. It might not bring in more clients (although it’s possible! ), and it might not make you rich (I guess it could…), but I guarantee it’ll make you feel better about the work that you’re doing. And the funny thing about it, is that it seems fairly simple. It’s something we can tell ourselves to do over and over, until we’re blue in the face. But it’s when we actually put it into action that our lives can change. Okay, I’ve held out on you folks for long enough. The real secret to being a happy freelancer is…. Only take the work you enjoy doing. It sounds radical, right? Sorry- you mean… you want me to enjoy my work? YES! I want you to LOVE what you do! And if you don’t love it, stop doing it. We are all so young and so old and have only as much time as we’re promised. Why would you waste that time doing something that doesn’t bring you joy? Even better- applying this tip to your freelancing business will not just make you happier, but it will improve business. Think about your favorite artists. Do they love what they do? Do they seem happy about it? Are they excited to get out of bed each day and create? I know that’s something that drives me to take my freelance photography full-time: every other freelance photographer I see seems to love the hell out of it. And I want to love the hell out of my life too! I want to do something that excites me every single day! It’s a lot of work. It’s coming home from a full-time job exhausted, ready to turn on some Netflix and pour myself a glass of wine until I pass out on the couch… and instead, turning on my computer and launching Photoshop. It’s giving up Saturday morning to go chase that warm sunrise light. It’s sacrificing evenings with friends to stay in and edit. It’s too much work to dedicate to something I don’t enjoy. Which is easy to say, but what does it look like in practice? For me, it’s an easy answer. It means- turning down clients. When I was studying photography in college, my university made it something I hated. I dreaded picking up my camera, to the point that I never wanted to touch it again after graduation. It was because I was being forced to practice all kinds of photography, not just the photography that I love. So now, if a client approaches me and says “hey! Can you photograph me on Christmas Day? !” I get to happily say NOPE and not feel bad. This is my career. Do I lose money when I turn down clients I don’t want? I guess you could look at it that way… or look at it like this: instead, I get to make money from clients that I do want to work with. And the good news is that I’m attracting clients who want to work with me too. So next time you’re dragging your feet to a shoot that you reluctantly agreed to, ask yourself if this is really the life you want. It’s okay if it isn’t! It’s taken me 25 years to figure out what life I want, and I’ll probably change my mind again next year. But for now, I’m going to do what makes me happy while I’ve still got the time. I mean, I’m passionate about a lot of people. Find me out on the streets every weekend protesting injustices to minorities. But what keeps me awake at night tends to be issues related to women. So when I was asked to come on to volunteer with Build + Bloom as their SISTERXSISTER Director, I was like FAM YES. SISTERXSISTER is a free monthly networking group for young women interested in creative media. We meet in-person in more than a dozen cities nationwide, connecting girls who are makers- whether that’s blogging, photography, modeling, graphic design- there’s room for everybody at the table. And sometimes, in these monthly networking meetups, we plan big photo shoots. So everything you see here is brought to you by sisterxsister. Everybody that came on to help put this together met through sisterxsister. 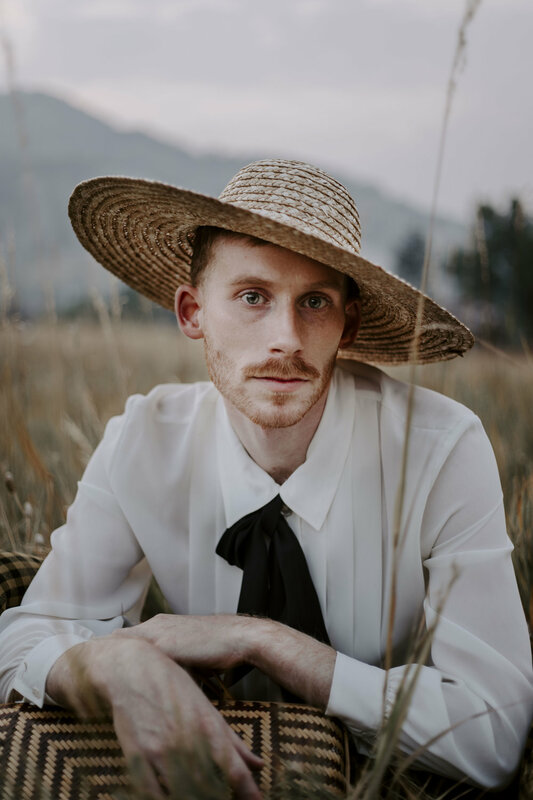 Photographer Krys Patton and I coordinated and produced the entire elopement, and all of the vendors will be linked below, too! Thanks to everybody who made this shoot possible! Thanks to Krys Patton for organizing and to Sky Mejias for renting her studio space out to us. If you’re interested in finding the sisterxsister event nearest you, click here. If you’d like to bring sisterxsister to your town, send an email to sister@buildandbloom.co! If absence makes the heart grow fonder, these two are more fond of each other than anyone else I’ve ever met. The majority of their relationship has been long-distance. Those of us who have done long-distance know that the actual distance doesn’t matter; it’s not about how far you are from each other. It’s the time that goes by and the life events that occur while your other half is missing. But when you see them again, it’s nothing but love and cuddling up and fingers intertwined and smelling their skin and tracing the wrinkles on their face from smiling so hard and just being surrounded by their warmth. It’s like Christmas every day. When I think about my ideal client, it’s couples like Anna and Justin. I mean, yes. They are very cute, and that’s nice too. But I’m talking about go-with-the-flow, down to earth, laid back couples who are down for anything. 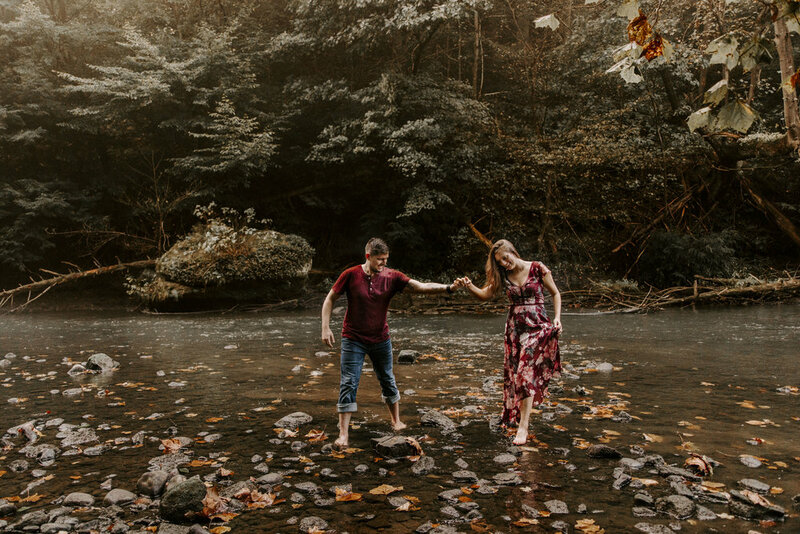 Like me texting them an hour before their session, “hey I found an even better location 10 minutes from the original location… want to switch?” Or when I said, “so there’s a river…. want to get in?” Justin just rolled up his pants and went straight in! A little bit of dancing, a whole lot of kissing, and a few “WHOA WATCH YOUR STEP!”s later, and we were drying off and heading back up to the cars. This river was at the very bottom of a valley, and the trek back up to where we started was actually a bit of a hike. I mean… I feel like I’m pretty in shape, but I was out of breath! We took a break halfway haha! 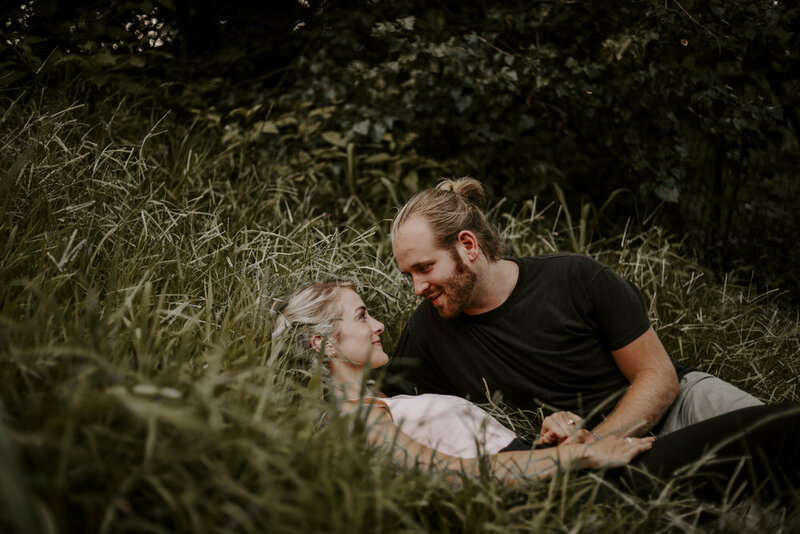 Kimberly reached out about a couple session to celebrate their new move to South Korea. A few weeks later I got a text from her boyfriend, Ryan,”Hey, can you call me?” Cut to three minutes later and I’m sitting in my gym sobbing happy tears because Ryan had just asked if I could also photograph him proposing during their couple shoot. All the feels!! Ryan and Kimberly went with my two-location couple package and really made the most out of their locations! 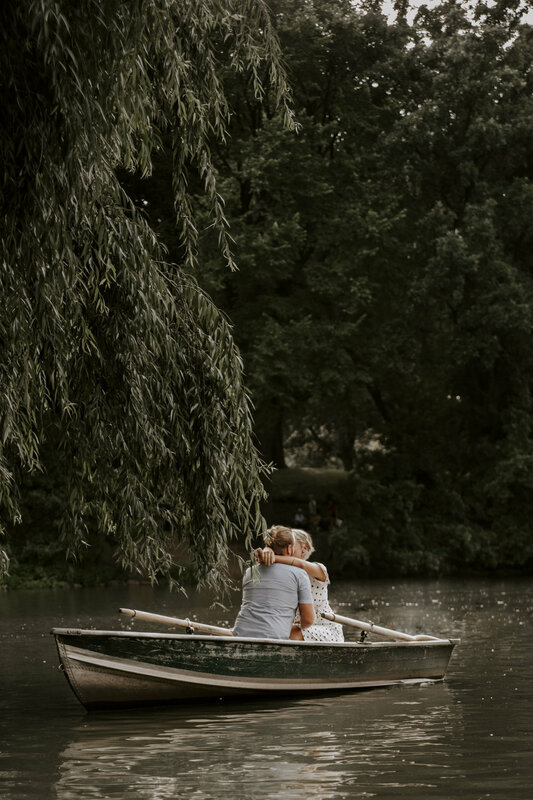 So we started on the boats in Central Park which are such a cute, easy, and fun way to add a unique little twist to your ~regular ol’ (and definitely not a secret proposal) couple session! Ryan and I coordinated everything before, and I gave him a little password that just he and I knew. When we finally figured out how to get the boat to stay in one spot (they’re tricky!! ), I wove the password into our conversation, and Ryan somehow got down on one knee… in a boat. I’m surprised the whole thing didn’t tip actually. This is the photo. I can die a happy photographer. Ryan and Kimberly did a few laps around the pond, I imagine talking mostly about how much fun I am, but also probably talking at least a little bit about their future and how Ryan coordinated the proposal, and whether or not Kimberly suspected anything. But probably mostly about me. After a few laps, they jumped onto dry land, changed into more casual attire and then we all got down. I mean like down in the grass. New York doesn’t have much greenery, but you’d be surprised how much you can find when you love nature and are naturally drawn to it always. If you know me at all, you know I REALLY take pride in wherever I live. So if I live in New York, I am a FULL BLOWN New Yorker, like do not ever question my love for this city, it is my city, I live here, I love here, I KNOW THIS PLACE! So I channeled that innate NYC knowledge to find a literal wildflower field? In the middle of New York City? The city of PAVEMENT?? Am I a wizard?? I’m going to be honest- I believe there should always be alcohol on hand, and Ryan and Kimberly thankfully share in that belief. They actually came to the shoot with a plastic bottle filled with wine (shhh please don’t tell NYPD), but I wasn’t expecting them to crack out an entire bottle of CHAMPAGNE?! When we realized it was starting to get drunk (and we were starting to get hungry), we jumped in a cab and drove across the water to one of my favorite shoot locations- a waterside plaza in Queens that looks back at the skyline. What did I say?! When I love a city, I love it hard! And I have loved exploring NYC and finding all of the best locations! Ryan and Kimberly danced until the light was gone, and they were illuminated only by the spark between them (hehehe). They’ve since moved to South Korea, where they are totally killing it and planning their winter 2019 wedding. 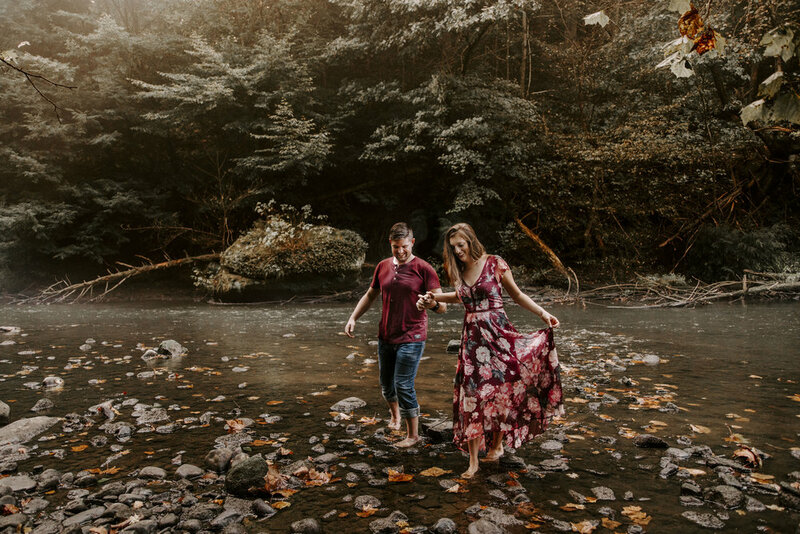 When they received their engagement photos, they immediately booked me for their wedding, which is fun for me because it’s going to be in Dublin! Cheers! I love the mountains. And not just in the simple way, either. I mean… I need the mountains to survive. My parents first took me to the mountains (that I can remember) in the summer of 1999 and it’s safe to say I was immediately hooked. 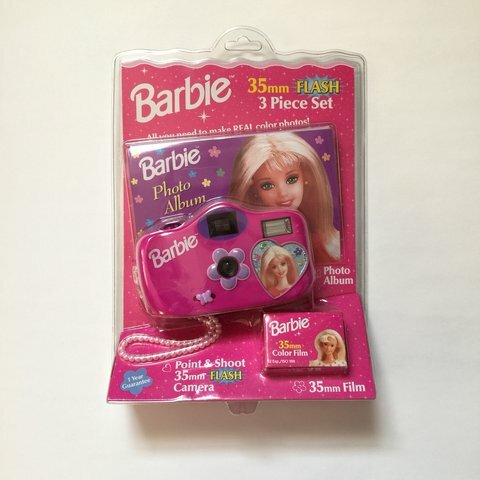 I spent my 6th birthday in the mountains that year, and I got my first camera (a 35mm pink Barbie camera with a flower on the front and a photo album that I filled with photos of Yellowstone). The mountains are where I spent my first summer away from home, when I moved to Denver with my sister for my Denver Art Museum internship. Whenever I’m feeling sick or unsure of myself, I run to the mountains. They have, quite literally, saved my life several times. I think that’s the truth for a lot of people. I don’t know anyone who isn’t in awe of the giant rock formation jutting out of the ground, reaching up to the skies. And if you’ve never seen the flatirons in Boulder, Colorado, I’ve just described them. These incredible, larger than life, red rocks that emerge from the ground completely unannounced. So how could I not plan a photo shoot there? We started in downtown Boulder, over a few tacos and margaritas (my absolute favorite way to start any and all sessions!!). One quick outfit change and a few minute later, we hit the range (like… home on the range??) for the real meat of the shoot! Here’s some tips if you’re looking to shoot at Chautauqua Park in Boulder. It. Will. Be. Busy. You can maybe even see some other photographers in the backgrounds of some of these photos (although maybe not. I’m pretty good at photoshop hehehe). When we arrived, there were FOUR other photographers within earshot. I think if I was still early in my career and still got nervous about other people watching me work, things could’ve gone poorly. Okay this was just the warm up for the whole reason we were there. Maybe it was the margaritas that made us totally forget hahaha. Nathan is A MAKER Y’ALL!!! Like a real life quilter (which I am just amazed by over and over again). 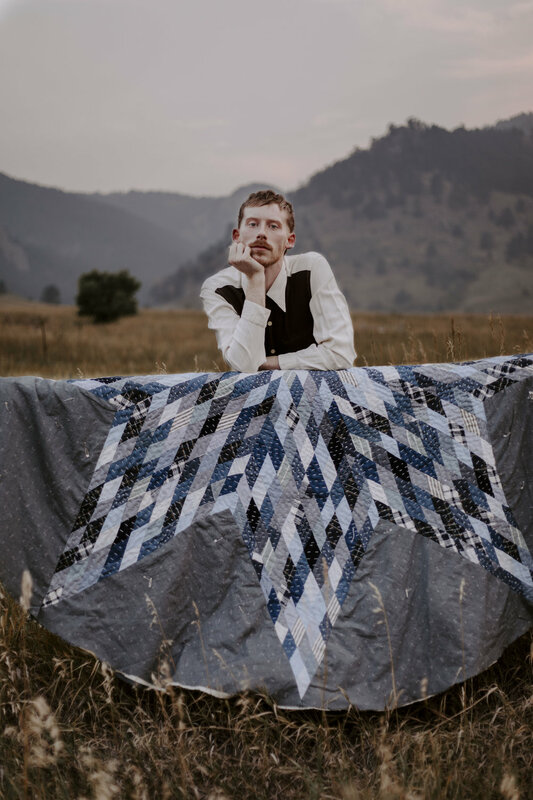 He REALLY did make this quilt in these photos, and he makes other quilts too, and I’m sure that if you asked nicely he would even make you a quilt!! It’s a fun Youtube challenge based off of a series by Youtuber Jessica Kobeissi. 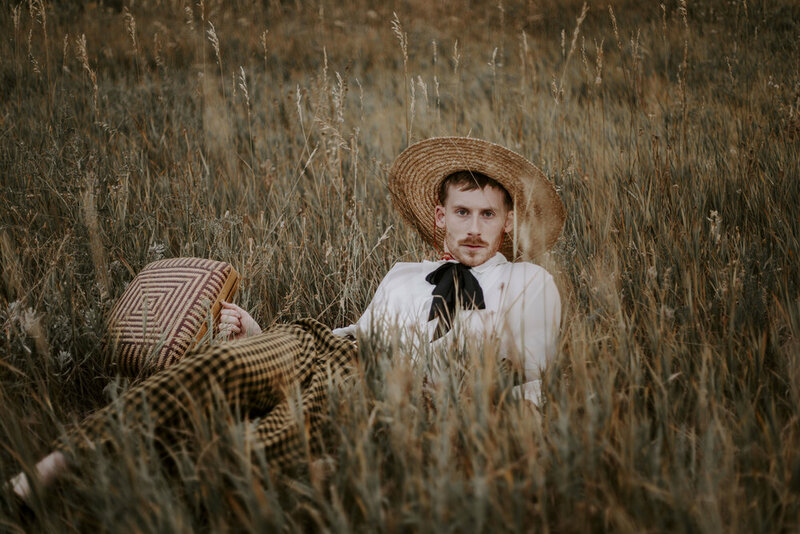 Myself and three other photographers (all of whom will be linked to throughout this post!) got together to make our own version for Andrea Fonseca’s own YouTube channel! Our videographer was Bethany, and our model was Katie! Everybody was so lovely to work with, so if you’re in NYC and need a creative, you should check them out! See that tiny little park right behind the man in the red (on the right hand side of the image on the left). I took a picture from inside of the park, and placed it on the right. It’s a teeny tiny green space outside of an apartment building. Natalia Wajda chose this location, and it was LOUD and tight! We were scrunched up against the exterior wall of Starbucks, and just as I’d get my shot… the light would change. This location was difficult, even though I do my best in front of greenery. I tried placing objects in front of the lens for the first time, too! See for yourself! LOCATION TWO: A lush hidden garden space behind a TJ Maxx. Maybe I’m biased, because this was my chosen location! I was so excited to shoot here…. until I got one photograph in. An employee of the restaurant next door came outside to tell us that the garden was private, and we couldn’t photograph there. Total bummer. Read: what to do when your photo location falls through!! I started to panic, and was so thankful that I was shooting with a ton of generous, talented young ladies, because they were spotted a park right across the street, and I ended up getting some shots that are maybe even better than I could’ve hoped for! LOCATION THREE: Have you ever gotten stuck in the middle of a shoot? Like think about a very long shoot, with the same subject the entire time. Maybe your feet start dragging, you’ve put in everything you’ve got, and you can’t imagine giving more. That was me at the start of the third location. Sophie picked it out and it IS super cute, but I’m so tired by now. I decided to let all of the other girls shoot first, and I went last, so that I could get my creative juices pumping again. It’s okay to chill out and take a break! LOCATION FOUR: Y’all!! WE MADE IT!! This is a street in NYC that I know pretty well, but I’ve never noticed this little archway! When Andrea picked it out, I wasn’t sure how I could use it. I was already in the mindset of utilizing different angles, so while the other girls photographed ahead of me, I was thinking about how I could use this location to my own advantage. How could I take a location I wouldn’t usually shoot in, and make the end photographs my own? Well I found a way. To show the model what I wanted, I threw my own booty up to the sky and laid my face on the bricks. Katie got it immediately and WOW!! So GOOD!! I only had that one shot in my mind, so the others were more of fillers. Unfortunately, the YouTube video has since been removed LOL, but you can just take my word on it that it was very fun, and y’all should try one! Challenges like this can push you outside of your comfort zone and really force you to be more creative! Which location was your favorite? I think it’s pretty obvious which one was mine! I love when people ask me questions about my photography, like “how did you start?” “how do you find people?” “how do you edit?” etc etc. Today, I’m going to answer all of those questions. It’s not a big secret. The truth is: I just literally never have any idea what I’m doing.I’m just taking chances and crossing my fingers that my clients will go along with it. Like this adorable couple, who didn’t even question it when I suggested they be my guinea pigs on my ~very first!~ in-home session. They’d just moved to a new neighborhood, and I thought- there’s really no better way to celebrate! This was my very first in-home session. I’d been pinning inspiration photos to a Pinterest board for a few weeks, and was finally ready to take the leap! 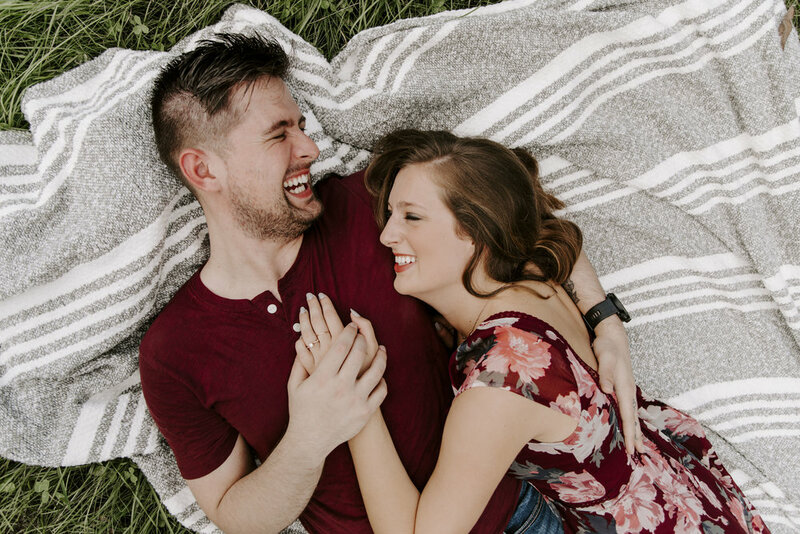 And if you’re wanting to do your own in-home session, there are a few things you’re going to need: an adorable couple, an adorable apartment, and a lot of light! I love how intimate and personal this session was. They’re SO snuggly and warm everywhere! Even when they’re dancing in the living room! That’s the beauty of an in-home session. They can lay down on the couch. They can cook in the kitchen. What are their favorite recipes? Let’s use them! Where are their snuggle spots? Let’s hang out there for a while! So often, we live in these homes but never experience living in them. I know for me, living in New York, I’m so busy all the time. I have to remind myself, “you pay rent for a reason. Enjoy this home!” If Zach and I ever had an in-home session done, we would spend all of our time playing board games in the bathtub with a bottle of wine. That is a classic Zach and Kara date night! And because this was a session to welcome Ruz and Michael into their new neighborhood, we also spent some time exploring outside! We even found a super cute little pie shop. PIE! You guys! PIE! I love pie. In fact, on my wedding day, I was adamant- no cake allowed. Pies only! This is a guide to San Diego. Do I know enough about the city to write an entire guide? Absolutely not. I’m just a New Yorker that likes to travel! In fact, as I’m writing this, I’m gearing up for my next trip. I’ve already taken 3 trips this summer (NJ shore, Ohio, and San Diego). This weekend, I’ve got another trip to the NJ shore planned, and then next week I head off for Denver. Then 3 more trips and summer will be over! So you know… one might say I get around ;) I travel by myself pretty frequently these days, but my favorite trips are the ones I get to take with my husband, Zach (cue the mush) (it’s our third anniversary so y’all will have to deal). Zach told me that this wasn’t the Grand Canyon (he was like “Uh I’ve been to the Grand Canyon. I would know. That is not the Grand Canyon.” Well guess what. I still don’t know, but I think it definitely has to be, right?? On the fourth of July, Zach and I woke up and stumbled half asleep into an Uber, on our way to the airport. I used to be so scared of flying, and tbh I’m not totally over that fear. I’ve been to so many aviation museums, and my dad used to fly planes when I was younger….. but I will NEVER understand how an airplane stays up in the air. I know its simple science and engineering. I’m mostly just unwilling to learn. LEAVE MY IGNORANCE BE. We touched down and picked up a Jeep Wrangler :’) Zach rented this for me as a birthday gift :’) Maybe it’s the Midwesterner in me, but I’ve always loved Jeeps. We made off toward the Zoo and Y’ALL!!! The San Diego Zoo is historic for its innovation in animal rehabilitation and display, but also it’s HUGE and so cool and educational!! At over 100 acres, it’s best to use the buses to get around the zoo… but I’m a New Yorker, so naturally I walked the whole thing. No lie…. we made a point to see each of the 650 species. By foot. It took us all of 4 hours, but we did it! New Yorkers walk quickly, so take that into consideration if you’re planning on also walking the whole zoo (but I have faith in you!). The zoo is located inside of Balboa Park, and if you catch the sky ride, you can get a beautiful view of the entire park and the surrounding city! We noticed the sun was starting to fade, so we literally ran out of the zoo and hit the road super quickly so that we could catch the sun setting over the ocean. Something about a west coast sunset, you know? We went to Sunset Cliffs and were able to stand over the ocean from above the cliffs and look down toward the beach. Talk about gorgeous. OH! And can we talk about these cuties on a cliff?? Hiiiii, hit me up for your cliffside couples session! Since your girl is broke af, I’m always looking for a cheap way to travel. I don’t want to give up traveling entirely, so I’ve gotten pretty good at finding ways to cut costs. I don’t need a 5-star hotel to stay in, and I usually save most of my money by renting out ~alternative accommodations~ ex. this super adorable Airstream!! Can you believe it was a fraction of the cost of a regular hotel or Airbnb!? We spent the next few days exploring the beaches, hills, and neighboring cities. We drove up and down the coast, stopping at all of the vegan fast food restaurants (there are SO many!!!) (my favorite? the chicken and waffles sandwich from Plant Power Fast Food) and surf shops. We spent time in North Park, which is like the Brooklyn of San Diego (or so I’m told). I probably ate at least 30 donuts from Dark Horse Coffee. There was a beautiful bar that I’d recommend to every single person that visits SD, called Polite Provisions and WOW. Gorgeous. Beautiful interior, unbelievable drinks, and amazing service that takes you back to another place and time! We kayaked out in La Jolla, which I definitely think is a must-do for all tourists. It was incredibly busy, but I think you could attribute that to the holiday weekend (again, do I know enough about San Diego to say this? Absolutely not!). La Jolla cove kayaking is on the top of every other blog’s to-do list, and I can’t argue. Tack on the snorkeling, too, and you’re set! Better yet- if you go to San Diego in August, you can view the shark migration. We were a little early for this (and yeah right- Zach would NEVER! ), but the snorkeling was still worth it. Head across the giant bridge to Coronado to do a whole lotta nothing if you’re under 65! There is Hotel Coronado which is famous for something I guess, but I felt as if this had the least culture to offer. Same things goes for Carlsbad! But the drive up to Carlsbad will make you realize what all those west coasters are talking about when they bring up smog! Bottom line: stick to San Diego. Oh and did I mention I’m now married to a sk8r boi? We hit Slappy’s Garage, which is a local skate shop, where we met a super cool videographer, and Zach got a new board (we spent a lot of time at skate parks). And of course, the whole trip was centered NOT around the 4th of July, but around THEMOST IMPORTANT JULY HOLIDAY: my birthday :) I turned 25!! We started the ~special~ day hiking out in Mission Trails Regional Park on the Climber’s Hike. At the top of the hike, there’s a few different routes for climbing (hence the name of the trail). We don’t know how to lead climb, but we did sit and watch for a while! How cute is my husband, by the way!? I’m so gross and am totally drooling while uploading these photos. Something that was so important to me when I started seriously considering marriage with Zach was that he and I would be able to travel together. Our first adventure was to Dublin for St. Patrick’s Day and it was a disaster. He touched all of my stuff and cleaned the hotel room even when I told him I prefer the mess. I thought we’d break up right then and there. But we have gotten so good at traveling together! We both know exactly what the other will want to see and do, and we tend to settle on amazing compromises. I haven’t found a better traveling buddy! This entire trip was like a dream, and if I’d taken my camera out more instead of trying to ~live in the moment~ I’d have more photos for you! Maybe on my next trip!